Free and Open—and Their Opposites article gives a a linguistic look at some tenets of Linux. I found it interesting reading because I have written articles to magazines on open source software to magazines and I have needed to think about the right words to use for writing. Here are some information picked from that article. This Burton Matrix tries to make sense of what different developers choose to do, or to change. Infrastructural protocols and software, such as the Internet’s and Linux, became ubiquitous by working in the upper-right quadrant. One also could place companies, products, services, patents and many other things in various places on the matrix. It is a good idea to spend some time considering the merits of moving them around. 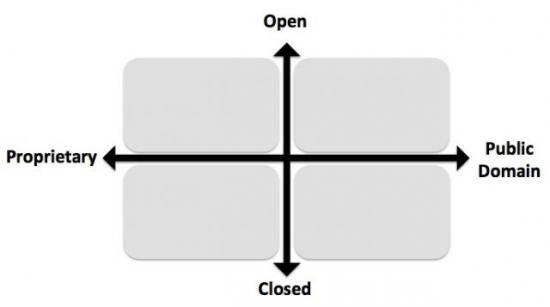 Free and Open—and Their Opposites has another matrix that can be helpful for understanding what happens when software, standards, patents and other forms of intellectual property—stuff that is, technically, proprietary—is set free. Please note that free and open have maximal meaning as nouns and verbs. Think of a world where you could simply download the blueprints of your future home for free just like you download any open source software today. A team of British architects developed just that and they are hoping their project called WikiHouse will radically change the way we think about building homes. How can this miracle be achieved you ask? the answer has to do with several new technologies that are making great progress in recent years including 3D printing and low cost C&C machines which can create extremely accurate parts on a large scale directly from a computer model. By creating WikiHouse as a place where users can find open source blueprints for building homes out of simple materials that can be printed in low cost C&C machines out of plywood they have turned the way we normally think of construction upside down. Now you can print the building blocks of your future house in a few hours from low cost plywood, bring them to the construction site and assemble them with two or three friends in a matter of one day. There’s a growing design trend, some even say there’s a revolution brewing, that’s beginning to have an impact on the world of design and how engineers go about innovating. Open source—buoyed by the likes of Raspberry Pi, Arduino, 3-D printing, embedded Linux, and strong community knowledge sharing and feedback—is coming to the world of hardware faster than many may think, and with it could come an increasingly democratized approach to the design cycle. In the world of open source, hardware is years behind software, which is predominantly led by Linux. And there’s a key reason for the discrepancy: Hardware is physical, making it more costly and difficult to reproduce. Beyond that, licensing can still be nebulous in some cases, and concerns about IP theft and who profits also hold some back. But the benefits—including the ability to prototype quickly off of existing, shared work, input from user communities, and low cost or no cost to entry—outweigh the concerns for many design engineers, makers, hackers, or hobbyists, as well as young companies such as SparkFun and Gadget Factory and even more established industry players. These benefits, for many, enhance professional engineering. And open-source hardware is finding its way into designs for everything from fun facial-recognition cameras that add mustaches to photos, to smart watches, to the technology used in the Red Bull Stratos space jump. Of those surveyed, more than half (56 percent) of professional engineers will use BeagleBone and Arduino in 2013. For hobbyists, that number jumps to 82 percent, and for students, 85 percent. Additionally, more than half (52 percent) of professional engineers are more likely to use open-source software in 2013, as well as 81 percent of hobbyists and 77 percent of students, as compared to years past. What do these findings mean for the engineering and design communities? Perhaps most importantly, these numbers demonstrate how engineers’ opinions about open-source are changing. Traditionally, open-source designing in the commercial space were seen as a risk. With the sheer availability of open-source tools and resources in recent years, those fears are being mitigated by increased adoption. Relatedly, platforms like BeagleBone and Arduino were once predominately exclusive to hobbyists, but now professional engineers and even students are using them. The gap is closing across these groups, demonstrating how technology is expanding design platform choices. I just such as the important information anyone deliver on your content. I am going to search for your site along with test out again here often. My business is a little specific My business is advised a great deal of fresh goods right listed here! Good luck for!